This recently renovated apartment sleeps up to 5 guests and is located right next to Antoni Gaudí’s famous Sagrada Familia, in the sophisticated neighbourhood of Eixample. The area features many cafés, trendy brunch spots, bars, shops and popular restaurants. 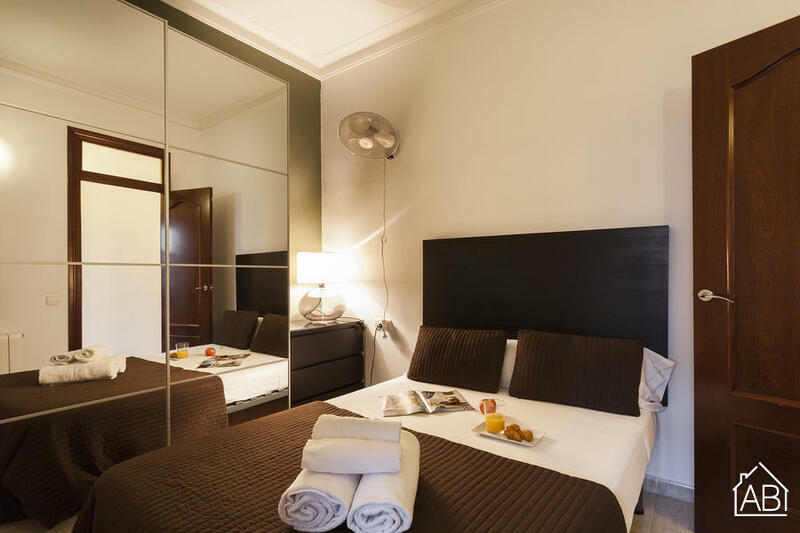 Fantastic architecture and excellent transport links make the neighbourhood ideal for a stay in the Catalan capital. The living room is decorated with homely furnishings and contains a large sofa, coffee table, storage unit and flatscreen television. The room opens out onto a private balcony from glass doors that let in plenty of natural day light. The kitchen boasts modern units and is fully-equipped with everything you could need during your stay including a dishwasher, toaster, oven, microwave, and pots and pans. Enjoy a quick bite at the breakfast bar or a larger meal with friends or family at the dining table, nestled in its own area off the kitchen and living room. Two double bedrooms and one single room are decorated with comfortable furnishings, lamps, and plenty of storage space, each with a wardrobe and/or chest of drawers as well. A sofa bed allows for two further guests to stay in the apartment. Two bathrooms make staying in this apartment very comfortable with 5 people. With internet, a washing machine, hair dryer, and central heating, the apartment provides plenty of comfort, even in the winter months, for more than just a couple of days’ stay.